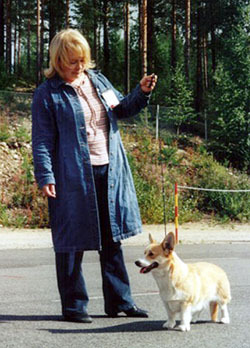 I am a Welsh Corgi Pembroke breeder from Kajaani, Finland. I bought my first Pembroke Netta "Puksipuun Polar Beauty" in 1998. With her joyful and lively temperament she fascinated me immediately. Since then I have been hooked to this lovely breed. I think that the Pembrokes have come for my life to stay. My first litter was born in 2004. Since then one or two litters of Suukkosuun Pembrokes have been born in our household per year. I wish I could breed Pembrokes with sound and brave mind, lovely foxy expression and with excelent typical movements. First of all the healthy dogs who are easy living with. I think it was a fate that I got Lapponian Herder to my other breed. I was showing succesfully my friends, Netta's breeders Lapponian Herder Lecibsin Duetto at shows around the Nordic and Europe and I fascinated about the breed. Nowadays I have this Lecibsin Duetto and one of her great-grandchild at home. Our first Lapponian Herder litter was born on 2009 and the second 2010.